You might already be a regular user of Microsoft's Office Lens app. This handy utility lets you capture images and text from various sources around you for repurposing in the Office suite later. For example, you can save diagram, lists, addresses, and these can be used within Microsoft's Office tools. What if you want to capture a big table of text? Formatting and readying text for charts is pretty labour intensive in my experience and captured text blocks are sometimes hard to manipulate, to clean up and into the correct cells. Microsoft says Office Insiders will be able to test out a feature called 'Insert data from picture' in Excel on Android. The tool is supposed to utilise AI to convert the chart/table photo into an editable one and in the video below it looks rather good at its job. Video segment about 'Excel: Insert data from picture' starts at 2mins 46sec. 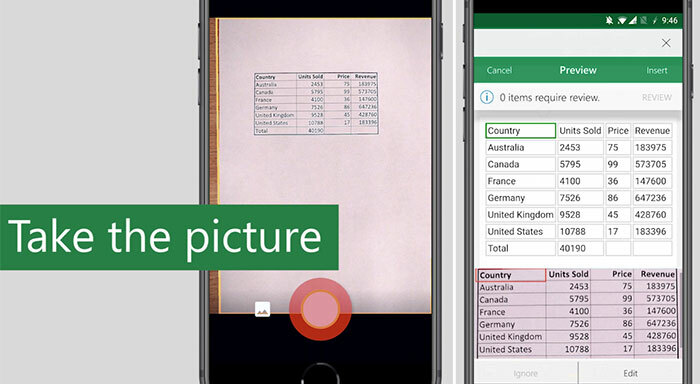 In the Excel for Android app, simply tap the insert data from picture button (lower right). The camera app will open and highlight what it considers to be table data in a live red border. Click the shutter button when you've got it steady and filling most of the frame. Next you crop out the irrelevant data using the resize handles before Excel processes and inserts the data into a ready-made table. At this stage you can tap Edit to correct any data OCR errors you have spotted. Finally, press insert and you can format and use the table and its data. Microsoft highlights that this mobile app feature output can be saved to OneDrive for access from all your devices. The example capture was quite a simple one but impressively clean nonetheless. I'd like to test the app on tables that are printed in various colours and designs, on various backgrounds, to see how well it fares. Slightly behind Android users, Office Insiders using iOS devices will get to test out the AI Excel table capture feature shortly. We don't know when those that aren't Insiders will get to use the Excel: Insert data from picture functionality. Microsoft says it will continue to optimise the feature over coming months. I use this feature on Bluebeam a lot to extract tables from images so good to see it is finally coming to Excel natively. Nice to see that Rick Moranis is still alive and kicking! He seemed to disappear after Ghostbusters and Spaceballs. Looks like he's landed on his feet at Microsoft.